By default, if open a .CSV file in a SharePoint the browser will prompt you to save the file. Ideally, you probably want the file to be opened directly in Microsoft Excel. There are two configuration options that need to be made. The instructions here are for SharePoint 2010 but are similar for SharePoint 2007. This ensures that the Excel icon is displayed alongside CSV files. Note: if you want to be prompted to open read-only or for edit remove ‘OpenControl=”” ‘ in the Mapping Key. Run the “Internet Information Services (IIS) Manager” application from the Start/Administrative tools menu. Select the server in the left-hand pane. Select “MIME Types” in the list of options in the middle pane. 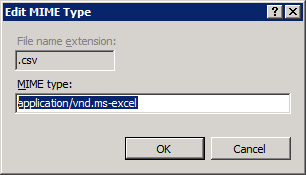 Then locate the .CSV entry (it should already exist) and change the MIME type to: application/vnd.ms-excel, and click OK.
Once these configuration options are complete perform an IIS Reset. CSV files should now be opened using Excel by default. You will be prompted that a change in file extension has occurred when using Office 2007. You will need to click Yes in this warning message. This note explains how to enable PDF indexing using the Adobe IFilter version 9.0 in Microsoft SharePoint 2010. This note is adapted from the Adobe note explaining how to configure the 64 bit IFilter for SharePoint 2007 (see: http://www.adobe.com/special/acrobat/configuring_pdf_ifilter_for_ms_sharepoint_2007.pdf ). Click the Search Service Application link in the list of applications. Enter pdf for the “File Name Extension” and click OK.
Right-click the Filters folder and select New Key. Enter “.pdf” for the key value. Finally, issue an IISReset and restart the Windows services “SharePoint Foundation Search V4” and “SharePoint Server Search 1”. Your PDF documents should now be indexed on the next indexing crawl. Will My MOSS Farm Stop Working? Or am I more likely to be abducted by aliens? Well, if you installed MOSS Service Pack 2 from a download before the 29th July 2009 your production MOSS Farm could stop working in the future. This is explained in Microsoft KB 971620 and in this Microsoft blog post. In summary, initial releases of SP2 was configured as a trial version, and unless re-installed, MOSS features will stop working 180 days after you installed SP2. The value “180” is reported in the KB, but this value seems to be different in practice. Select Convert license type in the “Upgrade and Migration” section. Select Check services enabled in this farm in the “Office SharePoint Server Shared Services” section. KB 971620 contains a link to a hotfix to correct this issue. This hotfix may require you to reboot the server. Before testing if the fix was applied correctly, issue an IISRESET before running Central Administration. Thanks to Tim at Cork County Council for pointing out this issue. In this post I explained how to determine if your SharePoint installation is service packed, and to what level. However, the situation is a little more complex since your MOSS 2007 farm will be running Microsoft SharePoint Services 3.0 and MOSS on top. When using Central Administration / Operations / Servers In Farm to report the version number you’re seeing the Windows SharePoint Services 3.0 version number. This will be updated when you run the Windows SharePoint Services (WSS) service pack update. Right-click the file Microsoft.Office.Server and select Properties. Version numbers from the Microsoft.Office.Server assembly do not follow exactly those for the WSS reported version number, but there is a close correlation. Click Servers in farm under the “Topology and Services” section. For a full list of version numbers, including interim builds see here. Update: 5 Nov 2009: See here for how to find MOSS 2007 and Windows SharePoint Services version numbers. When new databases are created, SharePoint uses the default SQL Server location. This is typically the “C:\Program Files\MS SQL\Data” folder. Many organisations use RAID or SAN storage which may have different locations, e.g. “D:\Database”. Within SharePoint you don’t have the option of specifying where the data and log files for the databases are created. Using the instructions in this blog you can change this default location for new databases. For existing database you need to “DETACH” and “ATTACH” the data and log files. Documents in SharePoint Document Libraries are stored in the SQL Server database. In most situations this works well – backing up the SQL Server content database backs up all the documents in a consistent way. However, for storing Binary Large Objects (BLOBs) may be inefficient and costly. It may be more efficient to store such BLOBs in the file system and then link these files to SharePoint Document Libraries. This can now be done through the ISPExternalBinaryProvider interface. Prior to SharePoint 2007 SP1 this component was available as a hot fix, but is now included mainstream. The interface is documented here: http://msdn2.microsoft.com/en-us/library/bb802976.aspx.